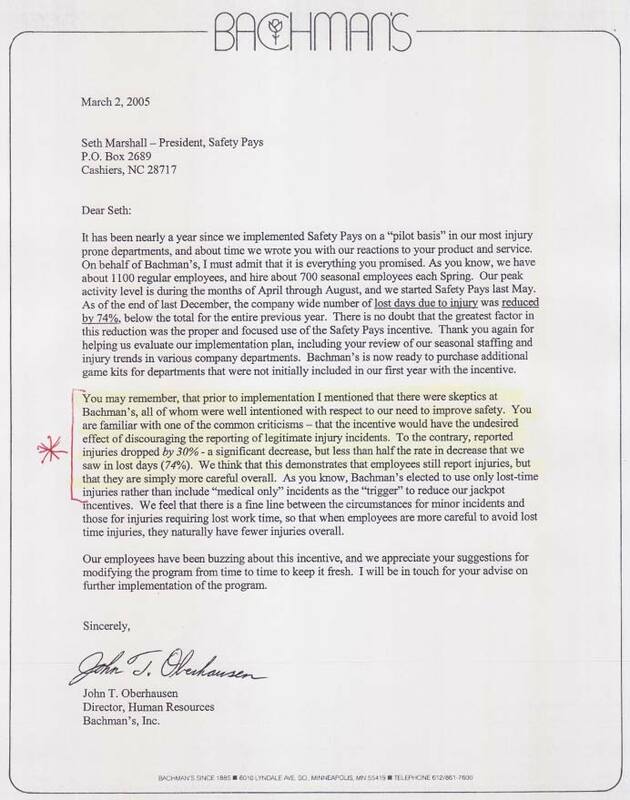 Over the years, one of the more common concerns safety professionals have when considering any safety incentive program is the potential for employee non-reporting of injuries. Will the safety incentive formula somehow motivate a given group of workers not to report injuries if and when they occur? That’s an especially important question to answer now that full OSHA compliance requires avoidance of any employee perception of ‘retaliation’ when reporting an on-the-job injury. For a complete understanding of how Safety Pays answers these questions, please click to Non-Reporting of Injuries. There you will be provided a full explanation of the redundant mechanisms our incentive system has in place to avoid employee non-reporting of injuries. But there’s no need to take it from us! Here’s what just a few of our customers have said about how Safety Pays has actually enhanced and improved on-the-job employee injury reporting! 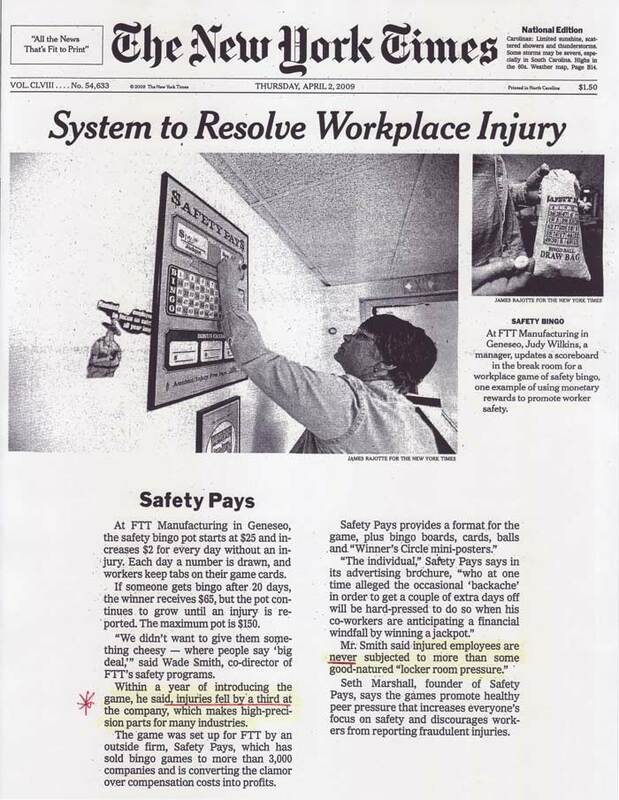 …because the failure to report a work-related injury is a violation of our safety rules, (which an employee can lose their game card for) we have seen an improvement in the reporting of injuries and we have a much better grasp on the incidents and injuries occurring at our facilities as compared to before we implemented the Safety Pays program! Thomas A. Hunn, Human Resources Generalist, Wisconsin Valley Concrete Products Co. 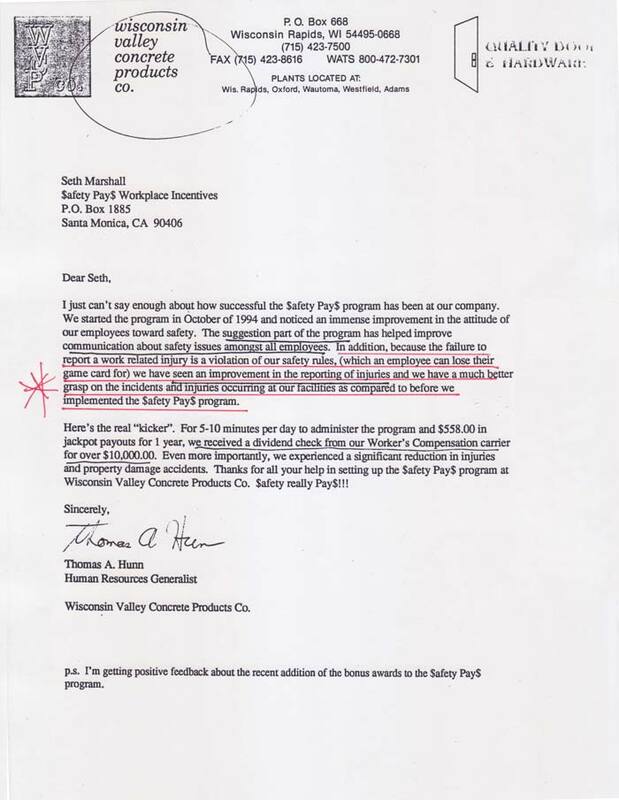 Prior to working with your program I was not in favor of offering financial rewards for safety. I was concerned that employees might not report incidents due to repercussions from their teammates. Instead …we have definitely noticed an enhanced safety attitude. Our employees are encouraging each other, watching for unsafe acts, and offering physical help when needed to be sure everyone is performing their jobs in the safest manner possible. – John T. Oberhausen, Human Resources Director, Bachman’s, Inc.
At FTT Manufacturing in Genesco New York, which makes high-precision parts for many industries, the safety bingo pot starts at $25 and increases. The game was set-up for FTT by an outside firm, Safety Pays. Within a year of introducing the game, Wade Smith, co-director of FTT’s safety program stated injuries fell by a third. 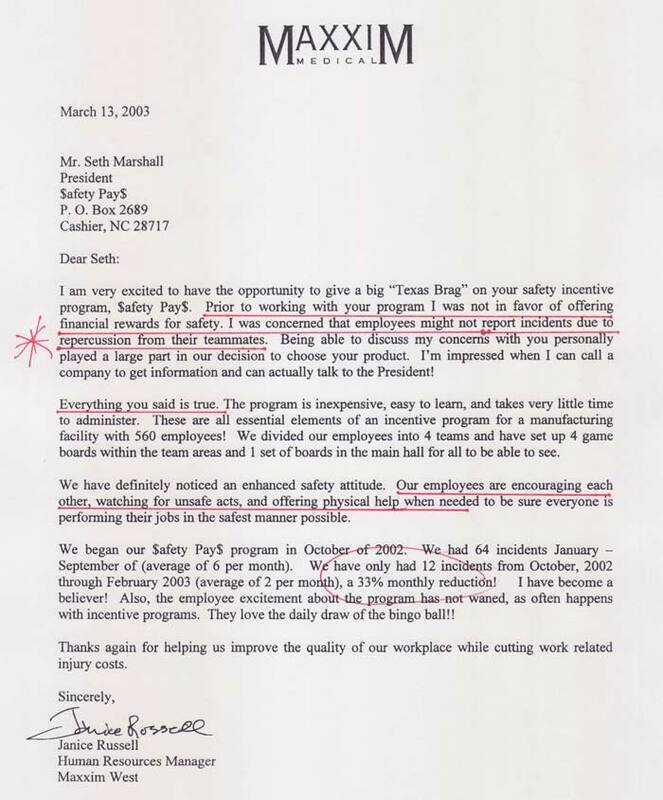 Further, Smith said injured employee are never subjected to more that some good-natured locker-room pressure.